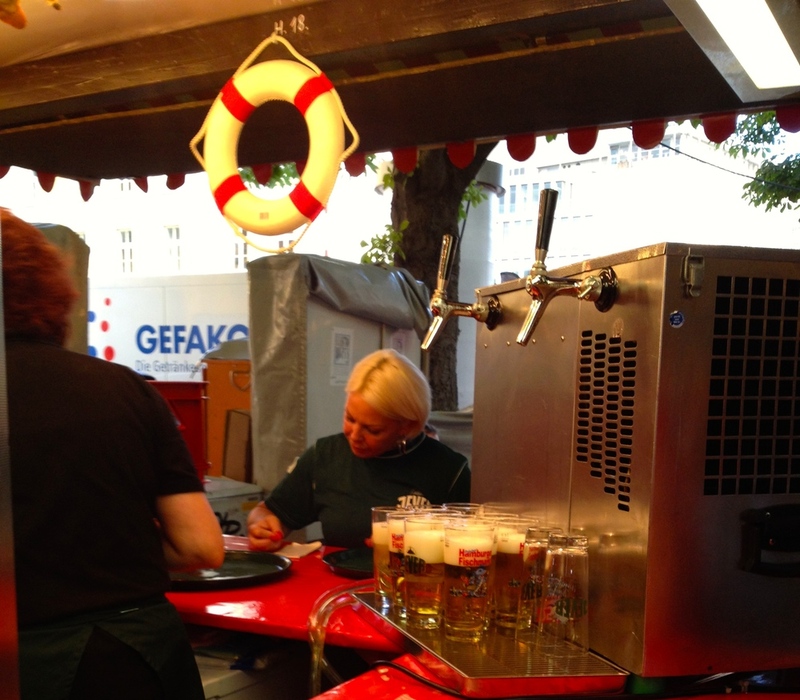 Every year in July the Hamburger Fischmarkt comes to Stuttgart. 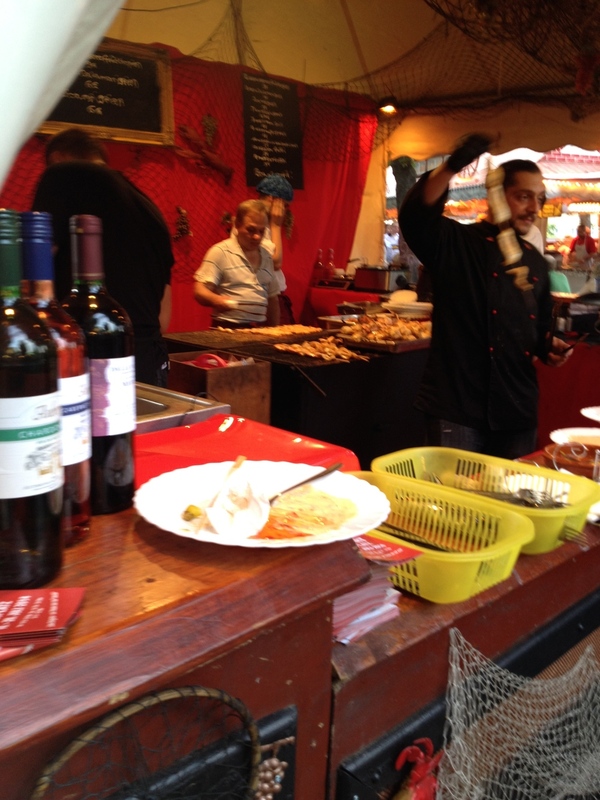 I really enjoy this fun festival from the city of Hamburg in the north of Germany, because it's one of the few times of the year when I can indulge in seafood. I grew up in the bay area of Maryland, so I really miss seafood in land-locked Stuttgart (especially Maryland steamed crabs). And although the style of seafood here in Germany is obviously different, the Hamburger Fischmarkt still satisfies my craving. This year, in an effort to get lots of good pictures for my blog, I tried a lot of the foods on offer. You can find just about every style of cooking at the fish market, including fried, broiled, sautéed, smoked, and grilled. This year I sampled the grilled calamari, fried fish and chips, and smoked salmon with kartoffelpuffer (potato pancakes). Each was delicious in its own way. The calamari was perfectly grilled with minimal seasoning except salt, pepper, and lemon. It was cooked on a long wooden stick and then served up with a kind of spicy remoulade that paired perfectly. The fish and chips was the most typical dish I tried, but it were good in its own way because the fries were crispy (not soggy) and the fish was still juicy, rather than dry. I'm sure they must use frozen fish in order to get it down here from Hamburg, however, they've got a method that works since the quality is still pretty high. The last fish-related food that I tried this time was the smoked salmon with kartoffelpuffer. I've been wanting to try traditional German kartoffelpuffer for a while now, but I usually see them with apple sauce, which for some reason seems a bit strange to me. When I saw them with smoked salmon and sour cream, I knew it was the perfect chance. This dish was easily my favorite of the night. The kartoffelpuffer tasted liked they were mixed with onions, which was tasty, and they had the right kind of texture: crispy outside and soft inside. The salmon was also quite good and paired well with the potato, onion, and sour cream flavors. This is our third year at the Hamburger Fischmarkt, and at past markets I've also had the shrimp scampi, fried calamari, and a fried fish sandwich. The fried calamari was just okay. I only tend to see the battered (usually frozen) rings in Germany, not the fresh fried baby squids and rings that I loved in the States (and served with a lemon-parmesan mayo is heavenly!). The scampi, on the other hand, had a delicious white wine and garlic sauce and came with a slice of bread to sop it all up. The fried fish sandwich was also well done. One food that I have yet to try are the pickled fish sandwiches. I did enjoy the Dutch herring on our recent trip to Amsterdam, however, so I may go back and try one some time this week when I'm feeling adventurous. You can also find whole fish grilled on a stick, which seems to be a somewhat common food at festival times, and which I've had on another occasion in a restaurant and which I enjoyed. 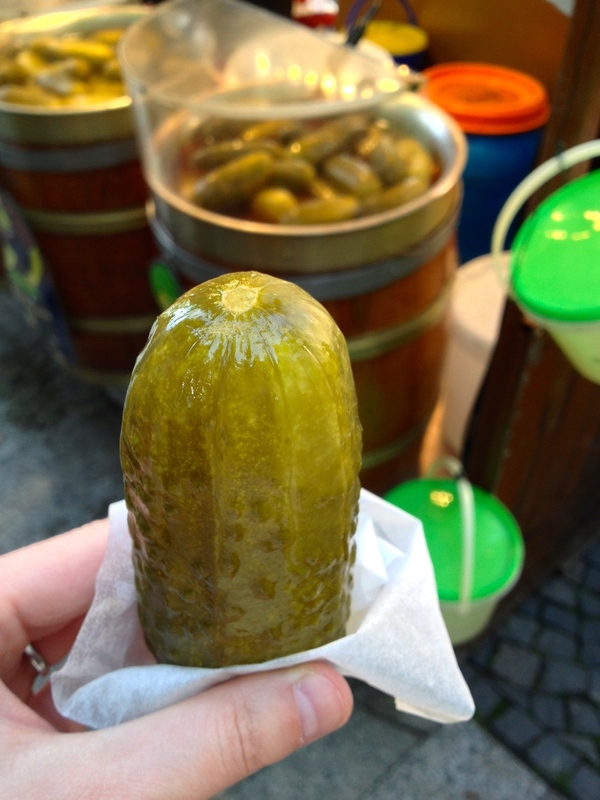 Of course your can find other traditional foods there, as well, including pickles (but not American dill pickles - sorry), candied nuts, pastries, and ice cream. In particular, I can recommend the stall that sells the fried dough. I don't remember the exact name, but they sell a variety of fried sweets including Berliner doughnuts, apple and cherry pies, and fried dough balls filled with chocolate, marzipan, fruits, and nuts. 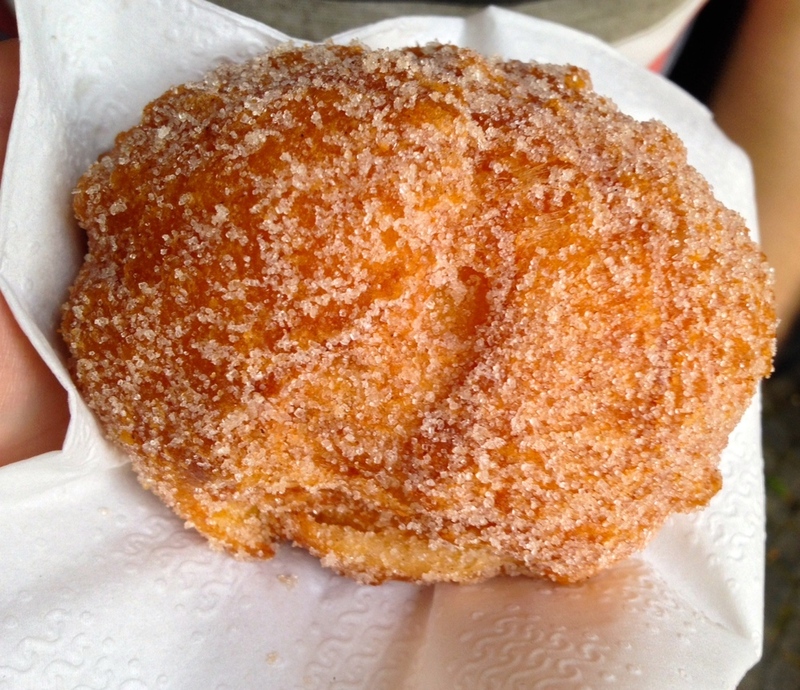 My favorite are the fried dough balls filled with either marzipan or chocolate and marzipan. They have a consistency a bit like a giant portion of funnel cake batter, fried and smothered in sugar. They make a rather decadent and delicious dessert. The ice cream stand is also delicious, though the flavors can sometimes be hit or miss. Matt's cookies and cream was rich, but my caramel could have used more caramel flavor. The big draw here are the handmade waffle cones that you can watch them make on a big machine with a waffle cooker and special hot metal cone for molding the waffles. There's nothing better than a fresh waffle cone with your ice cream. The Hamburger Fischmarkt is in town for a good week and a half. It runs from now until July 20th and is open from about lunch time until 22:00 or so in the Karlsplatz next to the Altes Schloss. If you're in town, then you should definitely check it out!